FootInnovate.com :: Bryan D. Den Hartog M.D. 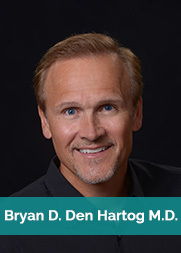 Bryan D. Den Hartog M.D. Dr. Bryan D. Den Hartog is CEO and co-founder of FootInnovate.com. He was a founding partner, board observer, and medical advisory board member of OrthoHelix Surgical Designs, Medina, OH. He has a private practice at Twin Cities Orthopaedics in Minneapolis-St.Paul, Minnesota. For twenty-seven years his practice has focused on trauma, arthroscopy, and reconstruction of the foot and ankle. He has published several peer-reviewed, clinical research articles on a wide range foot and ankle topics and has been active in the American Foot and Ankle Society (AOFAS), serving on their board of directors and several of its committees. He has also served as an AOFAS representative to the Board of Specialties for the American Academy of Orthopaedic Surgeons (AAOS). He is an educator who has served for more than 20 years as a faculty member for AOFAS and AAOS educational courses and has chaired or co-chaired educational programs for the AAOS. He has been a reviewer for Foot and Ankle International since 2004. His profound interest in education lead him to develop a website for surgeons called footinnovate.com. His passion for innovation has driven him to develop over 17 patents for the design and development of orthopaedic implants used around the world, as well as author more than 20 peer-reviewed scientific papers, all with the goal of improving the quality of surgeries and outcomes for patients with complex lower extremity injuries and conditions. Dr. Den Hartog obtained his Medical Degree from the University of Iowa College of Medicine, Iowa City, IA, and went on to a Residency in Orthopedic Surgery at the University of Kansas School of Medicine. His Fellowship training in Foot and Ankle Surgery followed at the Medical College of Wisconsin. Dr. Den Hartog is a Diplomat of the American Board of Orthopedic Surgery, a Fellow of the American Academy of Orthopedic Surgeons, and a Fellow of the American Orthopedic Foot and Ankle Society. Dr. Den Hartog has taken his surgical skills to clinics in third world settings, including Haiti and Venezuela.